Another day, another Xcode beta. You can now set Swift Error breakpoints, including restricting the breakpoint to specific error types. The in-playground API has been revamped. XCPlaygroundPage.currentPage now grants a reference to the current page. The playground live view support has been . . . If you thought Apple was slowing down with Swift, think again. Xcode 7.1 Beta 2 includes Swift 2.1. As always you can check the release notes for yourself because I don't necessarily address everything here. Enums imported from C automatically conform to Equatable so now they work in pattern . . .
A new try? keyword has been added. This attempts an operation that may throw (fail). If it succeeds the result is wrapped in an optional. If it fails the error is ignored and nil is returned. This seems like a pragmatic compromise but I have to imagine someone lost a . . . In Objective-C, every class is an instance of its metaclass. What about Swift? If you've looked closely at the Swift Language Reference you'll see two short paragraphs describing SomeClass.self and SomeClass.Type, a short example (that doesn't address Type at all), and that's it. In Swift, all . . .
Non-failable initializers can now chain to failable initializers by using ! Debug builds should have better performance due to using . . . I've been playing with the new reflection API in Swift 2 and found one constant . . . Swift 2 brings updated support for SIMD (Single Instruction Multiple Data). What exactly does that mean? Each CPU vendor has their own unique snowflake versionº but the premise is the same: process data in parallel chunks. 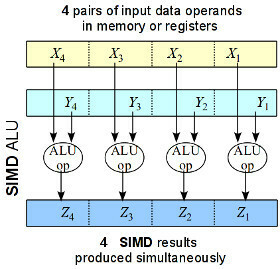 Each SIMD instruction operates on a group of values organized into what are . . .